I received a text this evening from one of my favorite people. It said, “Blog about the state fair. I’m feeling melancholy.” I responded, saying I was sad too, but I thought it was a little early to write about the fair since I was still in denial that it was over. We texted some of our thoughts about the yearly spectacle, and I began to truly consider why the State Fair, the Great Minnesota Get Together, holds me in its thrall. It might be understandable if I were an out-going, party loving extrovert, but I am not – I am an introvert. Go figure. 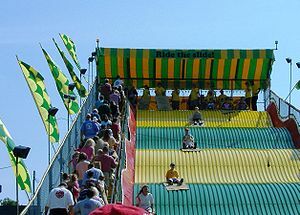 If you don’t know anything about the fair, here is a link you might find helpful: http://en.wikipedia.org/wiki/Minnesota_State_Fair. Wikipedia is a good place to start your MN State Fair education, but descriptions, definitions and statistics cannot capture the essence of the fair, it can only give you the framework. To explain the phenomenon of the fair I am going to steal an acronym from author and futurist, Leonard Sweet: The Minnesota State Fair is EPIC, truly EPIC. That means, according to Dr. Sweet, that it is Experiential, Participatory, Image-rich and Connected. Yep. And extraordinarily fun. Does that make it FEPIC? No matter. If you are in Minnesota during the last week of August, you simply must get yourself to St Paul, jog up Como Ave, push through the main gates with hundreds of other fine folks, and live it up at the fair for an entire day. Or two. My absolute favorite aspect of the fair is the music. You can buy tickets to the Grandstand acts, of course, but anyone at the fair has access to all the free music venues throughout the grounds all day long. These are professional musicians, often they are performers who are nationally known, eg: Riders In The Sky and Tonic Sol Fa. (Fair story about RITS: Our son was in high school, and had his wisdom teeth removed the day before he went to the fair with his buddies. I told him that he might not enjoy his day because eating would be a hassle. He went anyway. When he came home he immediately asked for pain medication. I started the “I told you so” routine when he interrupted, saying, “No, Mom! It wasn’t the food! It was “Riders In The Sky.” Their songs were so funny that I couldn’t stop laughing. That’s why my mouth is sore!”) I usually purchase a CD from my favorite musical group at the fair. This, of course, enlarges my eclectic collection of CD’s, which I enjoy all year long. The fair is such a huge experience, both in the size of the grounds and in the range of activities, that a single visit may not permit an individual to come away with an accurate impression. With this in mind, I am going to try to write my thoughts on the fair in a few blog entries. This will be helpful in a couple of ways: 1. perhaps I will be able to figure out why the fair has such a special place in my heart, and 2., as long as I write about the fair, it isn’t really over, is it?